Here is your Angel Card Reading & Channeled Message for the week of 3/19. As always, I asked the angels to please bring me a clean & clear reading for you, my clients, students, and followers. For today’s reading they took me right to the always wonderful Archangel Oracle Cards by Doreen Virtue, 1 card pull. Now this is a really interesting card for this week, as we are currently moving into a time of shift and challenge, astrologically. What better time to feel like we might need some extra protection? 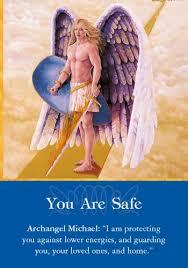 Archangel Michael helps us work through our fears, both real and perceived. He’s a protector and a warrior, always willing to do battle on our behalf, and to protect us. He brings us peace, and is eager to help us detach from situations and people who may be toxic, threatening, or not really all that good for us. Here’s some information about this new moon phase we’ve just entered from the fabulous Chani Nicholas at http://www.chaninicholas.com I have such a strong sense that our card for this week, and this new moon in Pisces, are deeply connected. It’s all energy, my friends. “Whatever you are struggling with, whatever feels heavy and hard to hold, remind yourself that there is something sacred about the way you are learning to hold it. You don’t have to do it well yet. You are allowed to learn along the way. You are allowed to make a mess. Just do so with a great deal of compassion for yourself. Yep. Extra protection and that feeling of safety help us at times like these. Please do call upon him as needed. He can be everywhere at once, and doesn’t mind multiple requests from you.